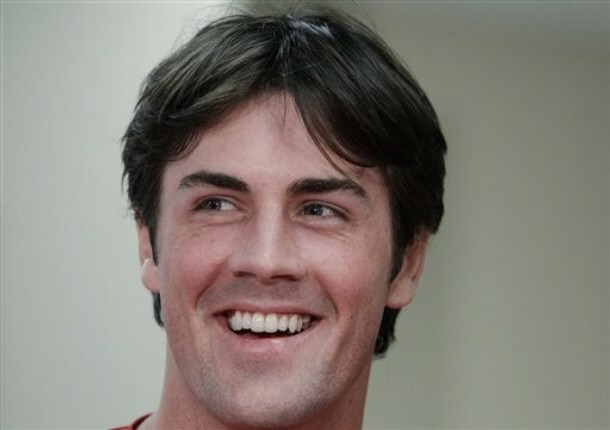 Cole Hamels enters the 2011 season as the youngest of the heralded Phillies starting rotation, having just turned 27 this past December. He’s already pitched four full seasons – plus the majority of a fifth – in the Major Leagues, and has established himself as a premier pitcher entering his prime. The problem that comes attached to every premier player is, of course, money. There’s no sense of panic in Hamels’s case, as he and the Phillies still maintain an arbitration-eligible year of control in 2012, but as Cole continues to perform, his price continues to go up. Among a roster that already features multiple large contracts that go beyond 2012, will the Phillies have room in the payroll for Hamels, and still be able to field a full, competitive roster? These and other concerns discussed after the jump. Right now, there are more pressing contractual issues for the Phillies to handle. Hamels having an extra year of control means Charlie Manuel, Jimmy Rollins, Brad Lidge and Ryan Madson get more attention in their respective potential walk years. We can expect Manuel back, as many indications seem to be that, even as spring approaches with no new deal in hand, Cholly and the Phillies will work something out. Cole Hamels will need to get paid soon. What's his worth? As for the remaining three, some questions remain. Rollins, in the middle of what appears to be a precipitous offensive decline, is making $8.5 million in 2011. Should his bat continue to evaporate – .875, .786, .719 and .694 have been J-Roll’s OPSes since 2007 – Rollins may be perceived as a rather noticeable offensive liability. The thing that sets Rollins apart, though, has been and always will be his stellar defense. As long as he performs at an elite level at short, his disappearing bat can actually be tolerated. Compounding that issue, of course, is a lack of near-ready shortstop prospects. Right now, it’s either Rollins or a free agent in 2012, and judging by the list of projected free agents next winter, I think Jimmy is the best fit. I’d expect him back, but he’ll probably fetch $9-10 million annually. Add that to the tab. One of Lidge/Madson will not be back in 2012. This team operates under the typical sense of bullpen management, with one pitcher designated for close games in the ninth inning, and Madson’s rising star may not fit in any other role for much longer. He’s making less than $5 million this year, and agent Scott Boras may look for something more along the lines of $7+ million per season for Madson’s next deal. This much is guaranteed: whether it’s for the Phillies or some other team, Ryan Madson will be a closer next season. If both he and Lidge leave – Lidge’s $12.5 million option for 2012 seems unlikely to be exercised at this point – there may be added financial flexibility for a new Hamels deal, but the bullpen’s depth takes a dramatic dive. Left Field: Raul Ibanez‘s three-year deal expires after this season, and he’s unlikely to return. Starting Pitcher: If Roy Oswalt isn’t healthy, isn’t effective or is deemed too expensive for his $16M club option – for which the Phils are receiving no money from Houston – he may not be back. Or, as some light speculation suggests, he may retire. Bullpen Depth: Madson, Lidge, Danys Baez and J.C. Romero are in the final years of their deals (plus Lidge’s noted option). As much Doc, Lee, Cole and Joe can eat innings, the club will actually need relievers. Bench Depth: Including backup catcher Brian Schneider, two bench spots will likely need to be replaced. Schneider and pinch-hit specialist Ross Gload are approaching free agency. Some spots could be filled internally, of course, but Domonic Brown looks to be the only young prospect set to be ready to contribute at a potentially high level in the next two season. Others may emerge as being potentially ready, but right now, most of the big help – Jarred Cosart, Jonathan Singleton, et. al – is multiple years away. Bringing this all back to the issue at hand: how much can the Phillies afford to pay Hamels? Or, better yet, can they afford not to pay him? Should Hamels and the Phillies go to arbitration next February, the likelihood of a new deal is sure to decrease. Arbitration hearings are notorious for alienating players, and when they don’t, they can end up resulting in massive overpays. Rest assured, Cole Hamels on the open market will be one of the most highly sought players in the league. Luckily, Cliff Lee‘s new contract seems to bust the conventional wisdom held in the Phillies’ front office that deals longer than three years for pitchers are taboo. Now, Lee could be the exception to the rule instead of the bearer of change, but if another exception is to be made, Hamels looks to be as prime a candidate as any. Among an aging – albeit still effective – roster, Hamels is the front-runner to be the best player on the Phillies over the next five years, Halladay and Lee included. This young, homegrown talent has already accomplished so much, and is just entering his prime. He appears in line to receive – and is, for all intents and purposes, deserving and worthy of – a five- or six-year deal worth around $90 million. The Phillies have entered a new era; they’re willing to pay lots of money to acquire (or retain) players they see as building blocks to a championship. Before various arbitration cases, potential option pick-ups and supplemental free agent signings, the Phillies have approximately $112 million committed to 11 players in 2012, and at least $50 million to as few as two (!) players in each of the next four years. That’s a lot of money. Luckily, people want to see this team play. Citizens Bank Park will almost certainly sell out for the 200th straight time later this season, and merchandise sales never seem to slip, especially when trademarkable phrases seem to continuously come into play (see: “funner,” etc.). The Phillies will need to rely on their fanbase – hey, that’s you! – and a competitive team to be able to afford these mega-contracts. If it becomes a struggle to afford these deals, players like Hamels may leave for greener pastures. Almost literally. Time remains for the Phillies to decide if they can afford yet another large contract on their books. In Hamels’s case, he happens to be worth it, at least as we sit here today at the dawn of a new slate of spring training games. He’s proven durable enough to make 30-plus starts per year, and effective enough to have the 15th-most strikeouts of any pitcher in his first five seasons since 1901. Cole Hamels is good. Real good. He was drafted and groomed by the Phillies, and rewarded the club by being a key part of a championship team. He’s done his part. Will the Phillies do theirs?